Dr. Manthiram graduated from Madurai University, India, with a B.S. degree in 1974 and a M. S. degree in 1976. He graduated from the Indian Institute of Technology Madras with a Ph.D. degree in Solid State Chemistry in 1980. After his doctoral degree, Dr. Manthiram worked as a postdoctoral researcher at the Indian Institute of Science in Bangalore for one year, as a Lecturer at the Madurai Kamaraj University in Madurai for four years, and as a postdoctoral researcher at the University of Oxford in England for one year. He joined the University of Texas at Austin as a postdoctoral researcher in 1986 and became Assistant Professor in the Walker Department of Mechanical Engineering in 1991. He was promoted to the rank of Professor in 2000 and he currently holds the Cockrell Family Regents Chair in Engineering #7. He is also currently the Director of the Texas Materials Institute and the Materials Science and Engineering Graduate Program. Dr. Manthiram directs a large, productive research group in electrochemical energy technologies with about 30 graduate students and postdoctoral researchers. His current research is focused on rechargeable batteries, fuel cells, solar cells, and supercapacitors. Specifically, his group is engaged in developing new, low-cost, efficient materials for these clean energy technologies, novel chemical synthesis and processing approaches for nanomaterials, and a fundamental understanding of their structure-property-performance relationships. Dr. Manthiram has more than 600 archival journal articles. He has also been awarded 10 patents. He has given more than 300 presentations including more than 200 invited talks, and has edited 8 books. His published work has been cited more than 30,000 times with an h-index of 90. 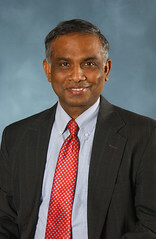 Dr. Manthiram received the Engineering Foundation Faculty Excellence Award in 1994, Mechanical Engineering Department Faculty Leadership Award in 1996, Mechanical Engineering Department Outstanding Teaching Award in 2011, the University of Texas Outstanding Graduate Teaching Award (one university-wide award per year) in 2012, the Battery Division Research Award of the Electrochemical Society in 2014, the Distinguished Alumnus Award of the Indian Institute of Technology Madras in 2015, and the Billy and Claude R. Hocott Distinguished Centennial Engineering Research Award in 2016. He is an elected fellow of the Materials Research Society, the Electrochemical Society, the American Ceramic Society, the Royal Society of Chemistry, the American Association for the Advancement of Science, and the World Academy of Materials and Manufacturing Engineering. He was awarded the Charlotte Maer Patton Centennial Fellowship in Engineering in 1998, the Ashley H. Priddy Centennial Professorship in Engineering in 2002, the BF Goodrich Endowed Professorship in Materials Engineering in 2006, the Jack S. Josey Professorship in Energy Studies in 2008, the Joe C. Walter Chair in Engineering in 2009, and the Cockrell Family Regents Chair in Engineering in 2014. D. Yoon and A. Manthiram, “Hydrogen Tungsten Bronze as a Decoking Agent for Long-Life, Natural Gas-fueled Solid Oxide Fuel Cells,” Energy and Environmental Science 7, 3069-3076 (2014). L. Li and A. Manthiram, “Long-life, High-voltage Acidic Zn-air Batteries,” Advanced Energy Materials 1502054, 1-7 (2015). C. Zu, A. Dolocan, and A. Manthiram, “Breaking Down the Crystallinity: The Path for Advanced Lithium Batteries,” Advanced Energy Materials 1501933: 1-9 (2015). W. H. Kan, A. Huq, and A. Manthiram, “Low-temperature Synthesis, Structural Characterization, and Electrochemistry of Ni-rich Spinel-like LiNi2-yMnyO4 (0.4 ≤ y ≤ 1),” Chemistry of Materials 27, 7729-7733 (2015). S. H. Ahn and A. Manthiram, “Edge-oriented Tungsten Disulfide Catalyst Produced from Mesoporous WO3 for Highly Efficient Dye-sensitized Solar Cells,” Advanced Energy Materials 6, 1501814: 1-7 (2015). L. Li, C. Liu, G. He, D. Fan, and A. Manthiram, “Hierarchical Pore-in-pore and Wire-in-wire Catalysts for Rechargeable Zn- and Li-air Batteries with Ultra-long Cycle Life and High Cell Efficiency,” Energy and Environmental Science 8, 3274-3282 (2015). G. Zhou, E. Paek, G. S. Hwang, and A. Manthiram, “Long-life Li/polysulphide Batteries with High Sulphur Loading Enabled by Lightweight Three-dimensional Nitrogen and Sulphur Co-doped Graphene Sponge,” Nature Communications 6, 7760: 1-11 (2015). Y. Zhao and A. Manthiram, “High-capacity, High-rate Bi-Sb Alloy Anodes for Lithium-ion and Sodium-ion Batteries,” Chemistry of Materials 27, 3096-3101 (2015). A. Manthiram, S.-H. Chung, and C. Zu, “Lithium-sulfur Batteries: Progress and Prospective,” Advanced Materials 27, 1980-2006 (2015). S. O. Kim and A. Manthiram, “Facile Synthesis and Enhanced Sodium-storage Performance of Chemically Bonded CuP2/C Hybrid Anode,” Chemical Communications 52, 4337-4340 (2016).